Jim Evers (Eddie Murphy) and his wife Sara (Marsha Thomason) work as a team in real estate. Thinking that he’s hit the jackpot, the family gets invited to scope out a mansion for sale. But upon entering the enormous, dark estate, they find that things are not as they seem. The mansion is haunted and the ghosts that haunt it want Sara. Jim will learn an important life lesson as it becomes apparent that he may lose his loving wife, forever. I liked it. It had a fun storyline, creepy ghosts, and enough humor to make it funny but it just didn’t WOW me like I hoped it would. Watch with mediocre expectations and you’ll be glad you watched this Eddie Murphy Halloween spook. 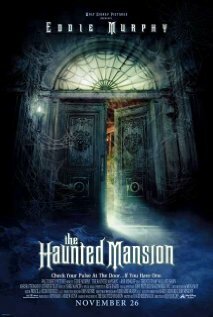 Check out the Family Movie Night Activity for The Haunted Mansion. Motherly Advice: As (almost) always, I watched this film with my filters on medium. I don’t want to get on a soapbox about this, but again I have to ask, who is rating these movies? PG would NOT be an appropriate rating if I were to rate it. It’s not sexually dirty and neither does it have a lot of swearing but it is dang creepy! In the beginning five minutes you see a man who has hung himself, then you see ghosts and lots of them, and the ending has this demon fire monster guy sucking the bad guy down to what is presumably, the great place of fire and brimstone. As a mother I would say The Haunted Mansion would be ok for ages 13+, but any younger and you’ll be having kids with bad dreams!! Trisha~ Just because I love creepy movies, doesn’t mean I want my kids watching them!